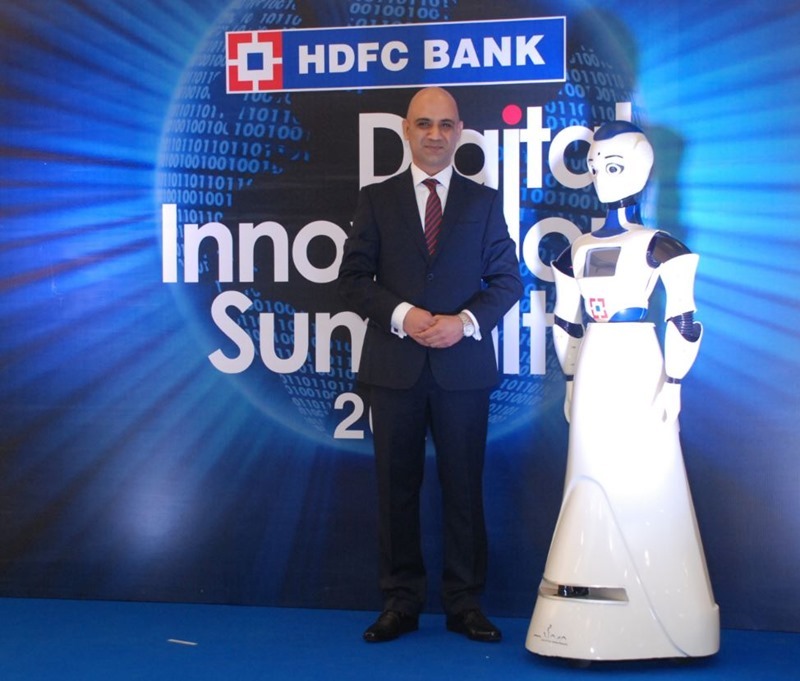 HDFC Bank has become India’s first bank to deploy a robot inside their branch for customer service purpose. This interactive humanoid, christened as IRA or Intelligent Robotic Assistant will be able to greet customers, and then offer a list of banking services which that customer can get accomplished inside that branch. HDFC has deployed this robot inside Mumbai’s Kamala Mills branch, and as per reports coming in, this interactive humanoid can guide the incoming customer towards these banking operations: Cash Deposit, Foreign Exchange, Loans. Once the customer selects ‘Take Me There’ option, the robot will actually take the customer to that particular counter, thereby saving time and human resources. We had reported last year in August that HDFC is working on deploying such interactive humanoid under their Project AI for introducing more automation within the banking sector. In the next phase, the robot would be enabled with facial recognition technology to detect customers, and then offer customized services. In a related news, HDFC Bank has already removed 4,581 jobs across India, due to ‘improved efficiency’. As of December 2017, HDFC reported 90,421 employees, which was 95,002 employees as of September 30, 2016. Thus, between September and December, HDFC removed 4,581 jobs, and in the justification, HDFC Bank has said attributed to improved efficiency as one of the reasons. Besides, HDFC also experienced their slowest profit growth in the same quarter, as their pace slowed down to 15%. Note here, that HDFC Bank has clearly stated that there is no link between the termination of employees and slow profit growth in the last quarter. And, also we would like to mention that attrition rate within banking sector is usually 16-22% every year, and within HDFC Bank, it is usually around 18%. But, it is not yet clear as to how many of these 4,581 employees were terminated for ‘improved efficiency’ or how many left their jobs due to voluntary reasons. And, it is also not clear whether the introduction of interactive humanoids inside bank branches can lead to job loss or not. Check out this video to see understand how Automation will lead to huge job losses in coming months & years! "HDFC Becomes 1st Bank To Deploy Robots For Customer Service; Fires 4,581 Employees Due To ‘Improved Efficiency’", 4 out of 5 based on 7 ratings. Maybe learn to read the statement before creating click-bait sensationalist titles. As mentioned in your article, the bank put out a statement stating “The drop in headcount has primarily been a result of the combination of natural attrition and a hiring at a clip lower than normal…”. This means they just did not hire new employees to fill ones vacated by outgoing staff. HDFC did not “Fire(s) 4,581 Employees…” as alluded in the title of this article. Sure they reduced their staff count, but that is very different from firing staff.